You might be surprised, our staff and patients are not! We see patients like this every day and are lucky enough to witness the change. If you too would like to see the end of your discomfort – make the decision today. Speak to any of our wonderful staff and start living the ActiveLife you deserve. 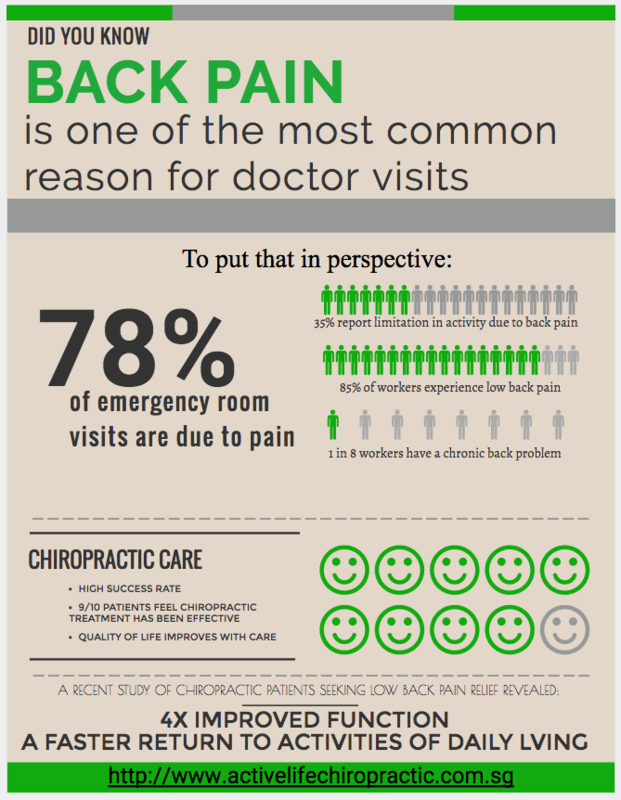 Its incredible to think – that even given these statistics shown in the infographic however, so many people still neglect the health of their back and spine. When our Doctors speak to patients and explain the information presented and how chiropractic can be of a benefit they are often surprised! Make your health your priority – take your spine seriously and speak to our Doctors at ActiveLife Chiropractic today! We have both male and female chiropractor working for our Singapore Chiropractic clinic. Our practitioners utilise a wide variety of techniques varied for each individual patient – Gonsted Chiropractic Singapore and the Gonsted Methodology are used by some of our Doctors. Take charge of your health and spine today. Speak to our wonderful staff will be more than happy to assist with your enquiries.